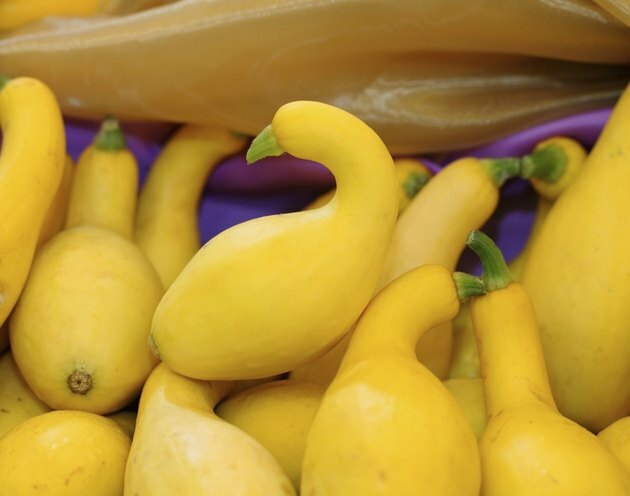 The unusual shape and bright color of yellow crookneck squash make it a standout among summertime vegetables. Like its summer squash counterparts, zucchini and straightneck yellow squash, yellow crookneck is a low-calorie star, with about 20 calories per cup. It contains vitamins A and C, potassium and dietary fiber, mostly in the skin which is soft and entirely edible. As a stand-alone dish, yellow crookneck is mild-flavored and may be served either hot or cold. It adds bulk, color and moisture to mixed vegetable dishes and baked goods. Rinse the squash, which should not be washed before storing in the refrigerator, in cool water. Rub gently with your hands to remove any soil or residue, then dry the squash with a clean kitchen towel. Set the squash on a cutting board. Steady it from rolling with one hand. Cut both the stem end and the blossom end off with a sharp kitchen knife. Slice the squash into ¼- to 1/2-inch-thick rounds. Because of its bent shape, the slices from the neck of the squash will be slightly thicker on one side than the other. Arrange the slices on a platter. Garnish with small parsley sprigs for an attractive color combination. Serve with other sliced, fresh vegetables and dips to create an appetizer platter. Rinse, dry and cut the ends off the yellow crookneck squash. Cut off the neck part, usually about 2 to 3 inches long, off the main body of the squash. Slice into 1/2-inch-thick slices. Cut the remaining, thicker part of the squash in half lengthwise. Place both halves flat-side-down on a cutting board and slice into ½- to 3/4-inch-thick slices. Measure 1 teaspoon per squash of canola, vegetable or light sesame oil into a large frying pan. Heat to medium-high and add the squash. Turn the squash gently with a spatula every minute or two, until it reaches a light golden brown. Add garlic, pepper flakes or other seasoning to taste during the last two minutes of cooking. Clean the squash, pat it dry and leave the ends intact to add visual appeal to the finished dish. Hold the yellow squash on a cutting board with the crooked, neck end pointing upward. Slice the squash in half lengthwise, starting at the blossom end and cutting through the stem end last. Both sides, once cut, will have a crooked end. Brush both the skin and the cut side lightly with olive oil. Sprinkle with kosher salt or other herbs or spices you enjoy. Set the squash pieces on the grill over a medium flame or coals covered with white ash. Lift the squash edge routinely to check for browning. Lift with a spatula and rotate the pieces a half-turn to develop grill hash marks. Turn the squash over and grill the cut side, again turning part-way through to make the grill marks. Remove from the grill when softened and medium brown. The skin of yellow crookneck may be bumpy or smooth, depending on the variety. Use yellow crookneck within three to five days of purchase.